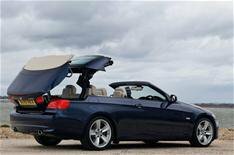 3 Series Convertible to keep metal roof | What Car? The next BMW 3 Series Convertible will have a folding metal roof, BMW has confirmed. BMW's 3 Series product manager Matt Collins revealed the decision was based on positive customer feedback on the current model. Customers liked the increased security, noise insulation and rigidity of the metal top. BMW will launch variants of the new 3 Series at six-month intervals, with the Touring model due to arrive in September 2012. The convertible and coupe models - which could wear a 4 Series badge - are likely to follow in March 2013 and September 2013 respectively. The high-performance M3 (or M4) model is expected to skip the six-month interval and arrive shortly after, because BMW wants to bring it to market as soon as possible. It will be available in coupe and convertible versions.